LG’s rooftop DOAS units operate with standalone controls that automatically switch modes between cooling, heating and dehumidification for accurate and automatic conditioning and control of the outside air being supplied to the building. The robust 2-inch foam-injected double wall construction increases energy efficiency and unit durability for a longer, more sustainable lifespan. 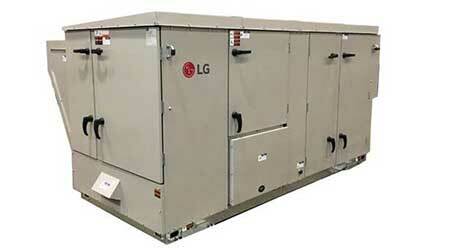 Available in a wide range of capacities, LG DOAS units are available up to 70 tons and are configured to be easily compatible with LG VRF systems. The LG DOAS systems are capable of delivering a maximum airflow (CFM) of 18,000. For added design and construction flexibility, the LG DOAS units are configurable with more than 190 options to fit nearly any project specification. Along with the other LG products, the LG DOAS units seamlessly integrate with LG controls giving customers a single point of management for both their HVAC and DOAS systems, as well as integration into a building management system (BMS). By incorporating LG controls into a DOAS system, customers can avoid the hassle of costly and convoluted third party integrations, creating a more seamless and fluid installation process and day-to-day operation.